STREAM PDX is a community podcast and storytelling studio. 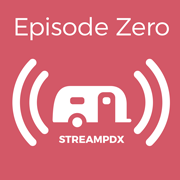 Episode Zero is a collection of podcast episodes recorded at the Stream PDX studio. If you're thinking about starting a podcast but don't want to commit to a whole series, you can publish an episode on Episode Zero! Listen to the episodes other creators have made below! Podcast Challenge 2016: Did You Know? Book a recording time at xoxo! Enabling and promoting the use of audio as a medium for self-expression and the transferring of ideas.